British educationists have stressed the need for employing new, student-centric teaching methods and strategies in medical education in Punjab. “The challenge for medical educators is to be aware of the new changes and to consider how the latest technology can be used to enhance learning,” said Prof Paul Duvall from University of Liverpool, UK, while addressing the inaugural session of a two-day workshop on e-learning at the University of Health Sciences (UHS) on Monday. Duvall was of the view that integration of e-learning into medical education could catalyse the shift towards applying the adult learning theory, where educators would no longer serve mainly as the distributors of content, but would become more involved, as facilitators of learning and assessors of competency. He said e-learning was not just about the delivery of content, but was a pedagogical approach which was flexible, engaging and learner-centric. “In diverse medical education contexts, such as here in Pakistan, e-learning could prove as effective as traditional instructor-led methods, such as lectures. Students would not see e-learning as replacing traditional instructor-led training, but as a complement to it, forming part of a blended-learning strategy,” Duvall said. He added that e-learning should be started as a pilot project in the various medical colleges of Punjab. University of Liverpool Centre of Life Long Learning Director Prof Ian Willis said innovations in e-learning technologies pointed towards a revolution in education, allowing learning to be individualised, enhancing the learner interaction, and transforming the role of the teacher. He added that combining traditional face-to-face instruction with web-based learning, ie blended-learning, was best suited for practice-based disciplines like medical sciences. Willis said the three-member British team visiting UHS under “Inspire” project was being funded by the British Council to support joint academic and research programmes between UHS and the University of Liverpool. He said the delegation, during its 10-day visit to Punjab, would also visit Punjab Medical College Faisalabad, Shaikh Zayed Medical College Rahim Yar Khan, Services Institute of Medical Sciences Lahore, Nawaz Sharif Medical College Gujrat, and Wah Medical College Wah Cantt to conduct workshops on faculty empowerment. The members of the delegation would also meet the officials of Pakistan Medical and Dental Council to discuss issues related to medical education in the country, he added. University of Liverpool Postgraduate Diploma and Master’s Programme Co-Director Dr Janet Strivens said most educational institutions in the world were now engaging in e-learning, and it was important to consider which courses could be delivered wholly on-line, and for which a hybrid (blended) model of learning should be adopted. “Before an effective e-learning strategy can be launched, academic and IT staff must be made aware of the technical tools available to them, how these can contribute to enhancing the learning experience and to review these thoroughly for feasibility and appropriateness,” she said. 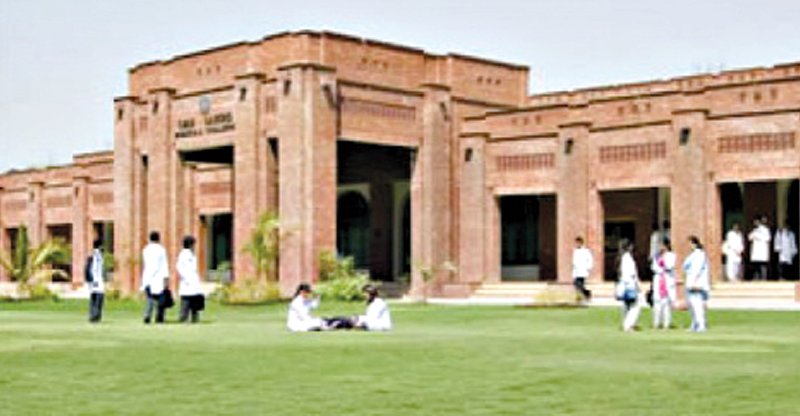 UHS Vice Chancellor Prof Malik Hussain Mubbashar said teachers in medical colleges needed to change their own beliefs, behaviour, perceptions and assumptions about learning and teaching in order to provide quality medical education to today’s medical students to transform them into competent and caring doctors of tomorrow. He said learning in this digital age would also require teachers to explore how best to exploit technology to further enhance the educational environment for students. Mubbashar added that both universities had a strong commitment to enhancing student-centred learning. Some pertinent issues in this regard were critical thinking, reflection, self-assessment and actualisation, which would be addressed in the workshops to be conducted by the British team, he added. UHS Centre for Innovation in Learning and Teaching (CILT) Director Prof Arif Rashid Khawaja said UHS had been awarded the prestigious ‘Inspire’ grant by the British Council to devise solutions in relevance to the unique local problems in medical education, with the support of University of Liverpool, UK. He said the UHS project had been selected as one of the 17 successful awards out of 123 applications received from both Pakistan and UK. The proposal was mutually selected and approved by both, the British Council and the Higher Education Commission (HEC) of Pakistan, after a detailed evaluation process. A large number of faculty members of affiliated medical colleges attended the workshop.